Fire: 150 acres Brush Fire Dark Canyon in the 3600 block of Barham Boulevard, Los Angeles. Los Angeles fire officials said the fire had been fully contained, but fire crews would remain on the line through Saturday to contain any hotspots. After a heavy aerial attack with water-dropping helicopters, ground crews smothered the fire, which began near the Oakwood Gardens apartment complex off Barham Boulevard and climbed into the Hollywood Hills. Crews said it is possible that the fire started in the parking lot of the complex. The winds were pushing the fire up toward the mountain. The fire was first reported at 5 acres. It grew to about 150 acres.Crews said the fire was contained at about 4 p.m.
A hotspot developed at about 3 p.m. off Forest Lawn Drive near the Toluca Lake Tennis Club. Ground crews responded to the spot fire.Forest Lawn Cemetery canceled services for the day. The cemetery was not threatened, fire officials said. One firefighter was sent to the hospital for lacerations to the ear and neck. Fire crews arrived at the location at about 1 p.m.
Two hundred firefighters were on the ground. Helicopters and engine companies staged atop Mount Lee, site of the landmark Hollywood sign. The fire was about a half-mile from the sign. Two boys admitted that they started the fire. The boys, who were visiting from another state, were staying in an apartment complex near the origin of the blaze, Villaraigosa said. 'There was a witness who watched them do what they (did) or at least saw the incident, so that's a good thing,' Villaraigosa said. Two boys turned themselves in to the Burbank Police Department, according to police. Their identities were not released. Investigators did not term the fire an arson case. Deputy Police Chief Michael R. Hillmann characterized the case as "an irresponsible act. Two maintenance workers attempted to stomp out the fire. Earlier this month, officials celebrated cutting down the one millionth bug-killed tree in the San Bernardino National Forest. It was a moment of understandable celebration because of the vast scope of the work: Trees had been dying at a high rate over the past decade, filling the overgrown forest with what are essentially standing matchsticks ready to explode. For more than three years, dead and ailing trees have been coming down at a rate of 750 per day, boosted by a $70million grant from the federal government. But as the sun shined brightly on another uncommonly warm March afternoon, the circumstances of that day's weather caused some concern. There's been little reason to make sandbags for residents to place around their homes for protection against heavy rainfall. People used to talk about the region's fire season. Stolen Fire Truck? A possibly stolen fire engine was found overturned in a creek today. morning. It belongs to Casa Loma Volunteer Fire Department engine found in a creek near Casa Loma Road. CDF, San Jose Fire and Casa Loma Responded. Fire truck from Casa Loma Volunteer Fire Association found in creek. A fire truck used by the Casa Loma Volunteer Fire Association in unincorporated Santa Clara County went off the road and into Llagas Creek early Saturday morning, and now investigators are asking questions about how the engine got out of the station without being dispatched. The report of an overturned fire engine was received at 5:44 a.m. and no one was at the scene when rescuers arrived at the accident site on Casa Loma Road and found the engine in the water. California Department of Forestry and Fire Protection Captain Jim Crawford said the engine had not been dispatched and that he didn't learn it had left the station until after it was discovered in the creek. Casa Loma Volunteer Fire Association Chief Kylee Vicha said she could not say when the fire truck was last seen at the station because of the ongoing investigation but acknowledged that it could have been stolen. "I'm waiting for the powers that be that do their investigation to come up with a plan," she said, speaking by phone from the accident site. "They're investigating. It's a possibility." The CDF, along with the Santa Clara County Sheriff's office, the California Highway Patrol, the San Jose Fire Department and the Uvas Fire Department, were at the accident scene Saturday. Vicha said the volunteers have had the truck for about five years. The engine is one of four the association has. The association provides fire protection for about 175 residents in a 5,500 acre area and assists in nearby Loma Prieta. "Our volunteers can respond in a matter of minutes," the association's Web site says, "where professional emergency agencies make take one or more hours to respond. WEST PALM BEACH, Fla., March 21 (UPI) -- When firemen are putting out blazes, their risk of dying from a heart attack is as much as 100 times greater than when they are hanging around the firehouse waiting for an alarm to ring. "We think the combination of psychological stressors and the physical stressors take a toll on the fireman's heart when he is actually fighting a fire," Stefanos Kales, assistant professor of medicine at the Harvard School of Public Health told United Press International. Kales and his colleagues scrutinized records of the Federal Emergency Management Agency on the causes of deaths of firemen, estimating the amount of time they spend in any one activity and correlating that with heart disease-related deaths. "We estimated that about 1 percent to 5 percent of the time, firefighters are suppressing blazes, yet that is the time when 32.1 percent of the heart disease deaths occur," Kales said. Many previous studies have found a relationship between heavy exertion and heart attack deaths, Kales said, noting snow-shoveling deaths of men. He said that when a firefighter goes into battle he carries heavy gear, he suffers from heat stress from both the fire and his protective clothing, and he is exposed to toxic gases and particulate matter in addition to climbing ladders and stairs and lugging high pressure hoses. On top of those physical stressors are the mental stress of entering a dangerous situation --the "fight or flight" adrenalin boost. Kales said that the risk of dying while suppressing a fire, depending upon what analysis is used, is 12.1 to 136 times higher when compared with having a fatal heart attack during non-emergency duties. Kales also found that among all cardiovascular deaths suffered by firemen, 13.4 percent occurred while responding to an alarm, 17.4 percent when returning from an alarm, 12.5 percent during training exercises, 15.4 percent while performing non-emergency duties, 9.4 percent while performing emergency medical services or non-fire emergency services. "Our study shows that firemen should -- from the time they are recruited until the time they retire from the force -- have cardiovascular risk reduction training and activities." Kales said. "It is also important that physicians who treat firefighters make them aware of the potential risks involved in their jobs if there are cardiovascular concerns." The researchers looked at 11 years of data kept by the government on deaths among firefighters, excluding the more than 300 deaths that occurred in the terrorist attacks of Sept. 11, 2001. During that time 1,144 firefighters died, and 449 of those deaths were classified as being caused by coronary heart disease. Kales said that 144 of the deaths occurred while the firefighter was actively attempting to suppress a fire. Another 138 deaths occurred while on the way to a fire or returning from a call. "This study shows that cardiovascular disease is an important cause of mortality among firefighters," commented Neil Coplan, associate director of cardiovascular medicine at Lenox Hill Hospital in New York. "Fire departments need to be vigilant in performing yearly physical examinations among their firefighters, and should attempt to reduce risk factors by engaging the firemen in physical activity, proper diet and encouraging smoking cessation." Coplan told UPI that fire departments also need to make sure that if possible cardiovascular issues are discovered, these problems are promptly evaluated. "The implications of this study for firefighters is clear. Modifiable risk factors, whether or not they are related to occupation, should be aggressively addressed." They suggested mandatory annual medical examinations, annual physical performance examinations and implementation of wellness and physical fitness programs aimed at reducing cardiovascular risk factors. Firefighters prepare for wildfires in U.S.
SANTA CLARITA, Calif., March 18 (UPI) -- Due to unusually dry conditions, firefighters in California are bracing for a fierce season of wildfires. "Santa Clarita Valley, just north of Los Angeles, has received just 4.34 inches of rain since the rainy season began Oct. 1. Surrounding areas have seen similar conditions. Firefighters are warning residents that such dry conditions are fertile ground for the spread of fire, the Los Angeles Daily News reported. "Basically, anywhere in the Santa Clarita Valley (has) potential for significant fire hazard," said fire inspector Jason Hurd. The Santa Clarita Valley normally has only 54 firefighters, but 23 additional firefighters have recently been brought onboard to address the wildfire threat. Fire engulfed several rooms in the Ventana Inn and Spa in Big Sur late Wednesday, California Department of Forestry officials reported. The blaze, which began about 5 p.m., took more than an hour to contain. Firefighters from the Big Sur Fire Brigade, the Mid-Coast Fire Brigade and Los Padres National Forest assisted. The fire consumed a group of rooms, a forestry department official said, but the number of rooms damaged was not known Wednesday evening. The official said the CDF sent three engines and an investigator to the scene, which by 9:30 p.m. was in the 'mop-up' stage. Ventana Inn staff contacted by telephone said they were busy assisting guests and declined to comment. Officials said the cause of the fire is under investigation." UNION-TRIBUNE STAFF WRITER CORONADO – A two-page letter from National City's fire chief is still reverberating in Coronado nearly a year later. Chief Roderick Juniel wrote last April that his South Bay department was having trouble providing a ladder truck to help Coronado fight its frequent fires. Juniel recommended that his neighbors get one of their own. In response, Coronado Fire Chief Kim Raddatz went to work reviewing his department's vehicles, staffing and number of fire calls. Statistics from five fire departments in South Bay and East County show Coronado has had more fires than its similarly sized neighbors since 2005, and that it has invested more money per capita on firefighters and equipment. In January, nine months after Juniel wrote his letter, the Coronado City Council agreed to spend nearly $1 million to buy more equipment and hire more firefighters. A new truck – a Quint, which can carry water and holds a 100-foot ladder – will take about a year to arrive. Raddatz and his staff still need to agree on its exact size and specifications. But the debate over fire protection, spurred by Juniel's letter, has continued at City Hall. Two council members wanted the city to spend more on fire protection, but were unable to sway the three-member majority when it came time to decide what to buy at the Jan. 16 council meeting. Councilwoman Carrie Downey is particularly alarmed that Coronado has more than 1,000 buildings whose roofs can't be reached with the fire department's tallest portable ladders, which are 24 feet high. Until the Quint arrives next year, Coronado will have to rely on ladder trucks from other cities to effectively fight fires in buildings with three or more stories. When Juniel wrote that cash-strapped National City was having a tough time providing mutual aid to Coronado, he suggested the fire department establish a ladder truck company in addition to its two engines and one ambulance. That would make the city more self-sufficient, he said, when dealing with its soaring daytime population and a coverage area of about 9 square miles. The total cost would be about $1.6 million: $1.4 million to buy a new ladder truck and replace an aging engine, plus $1.2 million to hire nine more firefighters to staff the truck. Juniel, a former Denver fire chief with several decades of experience, also urged both cities to jointly plan equipment purchases. The letter was released to the public by the Coronado city clerk after litigation was threatened a few days before the Jan. 16 meeting. Tanaka and Downey insisted that Coronado had the money. The city has an annual budget of $34.5 million with nearly $37 million in cash reserves. “We can't throw out the excuse that we can't afford it,” Tanaka said. (CBS 5 / BCN) SAN FRANCISCO San Francisco police are searching for a man they said set a three-alarm fire Monday evening that gutted the Hayes Valley apartment building where he lived. Police and fire department officials, working together as a Joint Arson Task Force, said Tuesday that they believe Silver Warner, 33, started the blaze at 52 Page St. near the intersection of Market and Gough streets. Warner, a local artist whose photographs have been published in prominent local publications like Hamburger Eyes, has not been seen since the blaze erupted around 5:08 p.m.
Police describe Warner as a white man just over 6 feet tall with a slim build and collar-length brown hair. He was last seen wearing a black stocking cap, a tight jacket, blue jeans, tennis shoes and black-framed glasses. He was also carrying a bike-messenger bag. Seventeen people were displaced and a firefighter was hurt after leaping from a fourth-story window during the containment of the fire, according to fire officials. San Francisco fire Lt. Ken Smith said advancing smoke inside the residential four-story building forced a firefighter out of a window and onto the roof of an adjoining building 12 feet below. The firefighter sustained ankle and knee injuries in the fall but was able to rejoin his unit, Smith said. All residents were accounted for and unharmed, though someone's cat went missing. Burning on both the third and fourth floors, flames eventually caused sections of the roof to cave in, and the rear stairs caught fire, making access more difficult, Smith said. He also called the blaze "stubborn" and said 125 firefighters were summoned to extinguish it during the three-alarm response. The fire was contained within the hour, but smoldering hot spots kept crews busy afterward. An estimate is still not available and water damage in lower units made the entire building unfit for immediate occupation. The fire appeared to threaten the neighboring Kanbar Performing Arts Center, but its concrete exterior acted as an effective buffer against the fire spreading, Smith said. A Santa Clara man was arrested Tuesday on suspicion of murder and other charges in connection with a deadly fire at a duplex Monday, police said. 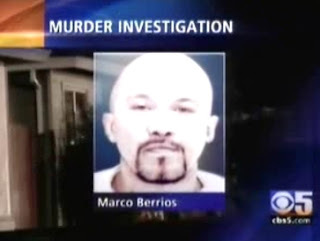 Marco Berrios, 39, was booked into Santa Clara County Jail on charges of suspicion of murder, suspicion of continued sexual abuse of a child and a probation violation, according to police. Berrios lived in the fire-damaged duplex at 4630 Snead Drive with his wife, Victoria Rojas, and her 9-year-old daughter. The 9-year-old girl reported the fire to authorities and was treated for minor injuries at a local hospital. The girl had told police that her mother and stepfather were still inside the burning duplex. Firefighters later located the charred body of an adult inside. Authorities have not yet identified the person killed in the fire because the body was badly burned, but family members believe the victim is Rojas. Berrios, believed to be the stepfather mentioned by the girl, was not home at the time of the blaze, according to police. Meantime, Santa Clara police officer Mike Garcia was credited with getting a family of three out of the duplex's back unit. Garcia knocked on a bedroom window, while avoiding flames, and made contact with a man who assisted in the rescue of two additional family members from the back unit of the duplex, including an infant, fire officials said. Retired Sutter County Fire Services Manager Chuck Vanevenhoven, right, chats with a guest at his recent retirement party at Hillcrest Plaza. The chief was in the fire service 34 years. He's had two hernias, plummeted through a ceiling, overturned a water tender truck and fallen off a roof. So maybe it was good, after 34 years in the fire service, that Chuck Vanevenhoven finally called it quits. The Sutter County Fire Services manager retired in January after serving seven of those 34 years as chief. He mingled and laughed at his recent retirement dinner at Hillcrest Plaza in Yuba City, greeting people at the door and swapping stories with new and veteran firefighters alike. The event was organized by Live Oak Fire Capts. Dan Yager and Dan Root, along with the Sutter County firefighters. Vanevenhoven overdid his time by nearly two years and said he has bittersweet feelings about the retirement. While the former chief relaxes and spends some well-deserved time fishing, hunting and spending time with his daughter, Paige, and girlfriend, Pam Sullivan, various captains will fill in until the hiring of another chief, according to Root. Root, a captain for eight months, has been with Sutter County for 24 years. Vanevenhoven began his career with the Regional Occupational Program, or ROP, at Yuba City High School in 1972. “It was called the fundamentals of firefighting and was held at (former) Walton Fire station,” he recalled. He still remembers missing his high school graduation night party because he was working with California Department of Forestry in Dobbins and got called to a fire at the Colgate Power House. Vanevenhoven did it all, including serving as fire chief and fire marshal before they were separate positions, as well as fighting fires. His sharpest - and scariest - memory is overturning a truck at an intersection just six months after he got hired. were going through an intersection Code 3 and I was in a great big water tender carrying 1,500 gallons of water, and a car hit me and knocked the water tender over on its top, and we skidded across the intersection,” he recalled. Vanevenhoven will continue to teach the fire academies at Yuba and Butte colleges, which he has done for 10 years. He also wants to visit his stations and former employees as often as possible. Some of the former chief's greatest accomplishments, he said, are upgrading the emergency vehicle fleet, which included 10 new pieces of equipment, including a water tender, and Type 4 engines. His biggest achievement was building the new fire station and Emergency Operations Center in Sutter in 2003. “That was huge, because that was where everyone went to for high ground during floods, and that little Quonset hut from World War II, that just wasn't cutting it,” he said. One of things Vanevenhoven said he will not miss is the inability to leave work at work. For now, Vanevenhoven he still has rarely a dull moment, even three months after officially retiring. His parents, Tom and Peg, live in Tierra Buena, and his brother Nick runs Van's Bike Shop in Yuba City. SACRAMENTO -- He was joined at the federal courthouse in Sacramento by agents from the federal Bureau of Alcohol, Tobacco, Firearms and Explosives and the Internal Revenue Service. Federal prosecutors on Monday announced a 19-count indictment against a San Francisco Bay area businessman for starting a 2005 blaze that destroyed a warehouse and six million bottles of wine. The prosecution of wine entrepreneur Mark Anderson marks the first charges stemming from the Oct. 12, 2005, fire that burned the Wines Central warehouse on Mare Island, a former Naval base in Vallejo about 30 miles northeast of San Francisco. It destroyed inventories from 92 wineries valued at the time at about $100 million. That included entire inventories of some small wineries, as well as some private collections of rare wines. "Mark Anderson put lives at risk to cover his tracks," U.S. Attorney McGregor Scott told reporters during a news conference. "Due to his greed and deceit, he now faces 19 felony counts." The charges against Anderson include arson, fraud, tax evasion, mail fraud and using a fake name. Scott said he did not expect anyone else to be charged in the warehouse blaze. The indictment had been under seal since it was issued last Thursday by a federal grand jury in Sacramento. Anderson was arrested the next day at his home in Sausalito, a wealthy Marin County enclave across the Golden Gate Bridge from San Francisco. He appeared Monday morning before a judge in San Francisco and will remain in San Francisco County Jail until a hearing scheduled for Thursday. He will then be transferred to Sacramento, where he is expected to enter a plea. Anderson had been under investigation since the fire, in part because he was at the warehouse when the blaze erupted. Investigators searched his home shortly afterward. Winemakers from Napa and Sonoma counties stored wine inside the warehouse, a former submarine repair facility. It was thought to be fire-proof because of its thick concrete walls and floors. Anderson had been storing some of his wines at Wines Central but removed most of them after being asked to do so by business managers several months before the fire. Douglas Rappaport, Anderson's attorney at the time, denied his client was involved in the blaze. Anderson would not have had any reason to damage the building because he had removed most of his wine, he said. Rappaport is no longer representing Anderson, and it was not immediately clear Monday whether he had retained another attorney. Anderson also faces charges in a separate case involving his own wine-storage business, Sausalito Cellars. He is awaiting trail on 10 felony counts of embezzlement related to missing wine valued at more than $1 million. Marin County prosecutors believe he sold rare bottles of wine to distributors from collections stored at his own facility. On Monday, Scott suggested that Anderson's involvement in the warehouse fire might be related to the Marin County case. "His motivation was (that) he had been embezzling wine and this was an act to cover up that embezzlement," Scott said. That case is on hold because a further charge may be filed against him based on new evidence that was not admitted in the earlier hearing. A preliminary hearing is scheduled for March 27 that would bring the total embezzlement charges in the Marin County case to 11, Barry Borden, Marin County's chief deputy district attorney, said Monday. San Francisco police are looking for a resident of the apartment building in San Francisco's Hayes Valley that caught fire early Monday evening after arson investigators found evidence that the blaze had been deliberately set. Eighteen people were displaced and a firefighter was hurt after leaping from a fourth-story window during the battle to contain the three-alarm fire, an official said. San Francisco fire Lt. Ken Smith said advancing smoke inside the residential four-story building on 52 Page Street forced a firefighter out of a window and onto the roof of an adjoining building 12 feet below. The firefighter sustained ankle and knee injuries in the fall but was able to rejoin his unit, Smith said. RIVERSIDE, California (AP) -- In the months before a fatal wildfire killed five firefighters, a serial arsonist was trying out different incendiary devices to see what worked best and setting nearly two dozen fires ranging from a few square feet to thousands of acres, prosecutors said. The suspect in the blazes, auto mechanic Raymond Lee Oyler, was sharpening his skills as the summer went on, the prosecutors allege, and progressively picking terrain that would result in bigger, faster-moving fires. "The evidence is going to show that there was a series of fires started by Mr. Oyler, that the devices that Mr. Oyler used had distinct similarities and that there's an evolution in the devices," Deputy District Attorney Michael Hestrin said Monday during a preliminary hearing in the case. The Riverside County district attorney's office has charged Oyler with five counts of first-degree murder, 23 counts of arson and 17 counts of possession of materials to commit arson. He has pleaded not guilty to all charges. After the hearing, which was to continue Tuesday, Riverside County Superior Judge Jeffrey Prevost will determine whether there is enough evidence to proceed to trial. On Monday, investigators outlined a string of fires that stretched from May 16 until October of last year, when five federal firefighters died trying to protect a home in the San Jacinto Mountains. Capt. Charlie DeHart of the California Department of Forestry and Fire Protection said he found remains at some of the fires of an incendiary device that contained red-tipped wooden matches, called "safety matches," bundled around a Marlboro Light cigarette. At others, he said, there were just a few matches, or matches placed perpendicular to the cigarette, with their tips resting on the cigarette. "There are similarities in the placement of the devices ... the matches are similar ... and they're all clumped into one geographic location," DeHart said. The wooden stick matches were unusual, DeHart said. "In my 20 years, I have never seen it," he said. "They're just not common. Usually we see paper matches or actual paper matchbook devices." But defense attorney Mark McDonald said outside court that the devices the investigators described were so different they could not be the work of one person. "To me, that doesn't go with logic," he said. "They started with the most sophisticated device in May, then went to matchsticks and then went back up. I don't think you can connect all these cases that easily." The deadly fire was ignited amid fierce Santa Ana winds and eventually charred more than 60 square miles, or 40,000 acres. Oyler, 36, was arrested October 31, days after the fire began. A two-alarm blaze in a Santa Clara duplex killed one person early this morning, but the "heroic" efforts of a police officer helped save three other residents. A 9-year-old girl reported the blaze at 4630 Snead Drive. She told officials that the fire trapped her mother inside the home, Fire Department Battalion Chief John Scanlon said. Fire department officials have not yet identified the body, stating it is too badly burned to determine whether it's a man or woman. But one family member is certain the victim is Victoria Rojas, who lived in the unit with her 9-year-old daughter. Santa Clara police officer Mike Garcia arrived first to the duplex, police Lt. Mike Sellers said. The girl met him in the front yard and told him that her mother was trapped inside. Flames shooting out the side of the house forced Garcia to crawl to the back of the duplex, Scanlon said. He pounded on a window, waking a couple sleeping with their infant. The adults handed the child through the window to Garcia, Scanlon said, and then Garcia helped the couple climb out the window. As Garcia raced back to the front of the home, Sellers said, he realized the home was a duplex and that the girl's mother was still inside. At that point fire crews rushed inside the home to fight the blaze. Wendy Moulton, the 9-year-old girl's aunt, spoke to her niece after the fire. According to Moulton, the girl said she began shouting for her mother, who did not respond. The girlthen ran down the hall and out a side door in the kitchen. Moulton said the girl grabbed a telephone before leaving the home and called 911. It took about 30 firefighters half an hour to declare the blaze under control, Scanlon said. Scanlon said the 9-year-old child who reported the fire was taken to a local hospital. The girl was not injured and is now with her maternal grandmother, Moulton said. She said Rojas has two older sons. According to neighbors the woman and her daughter had lived at the house for four years. It is with a heavy heart that we share word that Bella, the 14-year-old Border Collie nicknamed "the wonder dog' - who proudly responded with her LAFD handler Deresa Teller on scores of high profile search and rescue assignments, has died from natural causes in Los Angeles. Possibly the most renowned search canine in our nation's history, Bella was deployed with Deresa to the Oklahoma City bombing, World Trade Center attacks and countless other official assignments. Bella remains one of the few canines to have attained formal certification in wilderness search, disaster rescue and cadaver recovery. She was in every sense of the word, a 'wonder dog'. In our country's darkest hours, Bella shouldered the hopes of a nation. Our profound sense of loss is therefore only lessened in knowing that her grandson Ranger and other descendents are today exhibiting the same prowess that made Bella a preeminent search and rescue canine. Bella is credited with helping rescuers locate the remains of four victims after the 1995 Oklahoma City bombing. In early 2001, Bella was diagnosed with a troubling form of cancer in her right foreleg. Once word spread that costly radiation treatments could not be municipally funded - or afforded by heartbroken Teller, a stunning groundswell of community support allowed Bella's necessary treatment, cure and return to readiness. 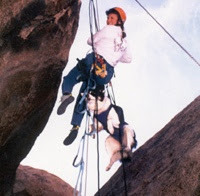 In August 2001, she helped Ventura County, California authorities locate the body of missing murder victim Megan Barroso in a rugged ravine near Simi Valley. Bella was medically cleared for her full return to 'disaster response' duty on a bright and cheerful Monday morning, September 10, 2001. Firefighter/Paramedic Teller could not have known that little more than 24 hours later, she and Bella would be aboard a military cargo jet headed for New York, where they helped find approximately 20 victims of the terrorist attacks. Less than six months following the cowardly attacks in Manhattan, Bella and Deresa were again deployed with the LAFD-FEMA Urban Search and Rescue Task Force (CA-TF1); in this case to maintain a vigilant regional presence during the sixteen-day Winter Olympics in Salt Lake City. In these and other deployments, as well as countless public outreach events during her long and eventful life, Bella was not merely a member of our LAFD family, but also a well-respected and readily embraced ambassador for our nation's first responders and specialized rescue teams. 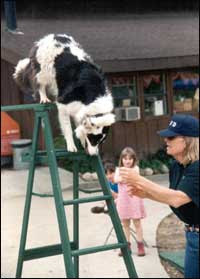 Bella formally entered retirement in 2003, at nearly eleven years old. When not herding chickens for enjoyment at home, the playful yet gentle Bella could be found comfortably cuddled with a stuffed toy lamb she had since she was a puppy. Josefina is suing her own church after managing to set herself on fire by kneeling too close to candles while praying at the Mary Immaculate Catholic Church in Pacoma, California. Martin is seeking punitive damages from the archdiocese, the Roman Catholic Archbishop of Los Angeles, Mary Immaculate Church, and the manufacturer of the skirt she was wearing. Josefina Martin suffered third-degree burns to her ankles, legs, back and arms when her skirt caught fire from candles in front of a statue. (AP) RIVERSIDE The man accused of setting a Southern California wildfire that killed five firefighters last fall is being charged with additional counts linking him to 13 other fires, authorities said Friday. The amended complaint charges Raymond Lee Oyler with 19 additional counts of arson and using an incendiary device in setting the other fires, said Riverside County district attorney's spokeswoman Ingrid Wyatt. The 36-year-old auto mechanic is expected in court Monday for a preliminary hearing on five counts of first-degree murder, 11 counts of arson and 10 counts of use of an incendiary device in connection to the deadly wildfire and the other blazes that were ignited in the same area. He is now charged with 22 arsons in addition to the deadly Esperanza Fire and 17 counts of use of an incendiary device. Oyler was originally charged in a string of fires that began in June, but the amended complaint adds charges for multiple fires in May and June, and one new fire apiece in July and September. An evidence log obtained by The Associated Press shows investigators recovered pieces of a cigarette-and-matches incendiary device from at least four of the new blazes. The log also shows 62 suspected arsons in the Banning area between May 16 and Oct. 27. Wyatt said Oyler would likely be arraigned on the new charges before the preliminary hearing begins. "The investigation doesn't stop once we file charges, it's still ongoing," she said. Oyler was arrested Oct. 31 after a wind-whipped fire raced through the foothills near Banning, about 90 miles east of Los Angeles. He has pleaded not guilty to the original arson and murder charges. His attorney, Mark McDonald, did not immediately return a phone call Friday. A sheriff's report obtained by The Associated Press on Thursday said Oyler's cousin told investigators the suspect spent an entire night one week before the deadly blaze "casing the area" for a good arson location. Oyler's girlfriend also told investigators Oyler wanted to start a fire as "a diversion" so he could get his pit bull out of the Banning Animal Shelter, according to the report. In an interview Thursday, attorney McDonald said the cousin was not a credible witness because she had a feud with Oyler and his closest relatives. McDonald said Oyler's girlfriend was badgered by investigators and she now denies telling them any of the information in the report. "She was badgered, just badgered," McDonald told the AP. "They would say 'Didn't you know this?' and 'Didn't you see this?' and they were telling her she could be implicated" in the arson. Oyler's cousin, Jill Frame, told investigators that she was at Oyler's house on Oct. 22 when he and his girlfriend began arguing because he hadn't come home the night before, according to the report. Oyler told his cousin he had slept in his car outside Banning High School because he was searching for a good place to start a fire on a nearby mountain, the report said. Frame also told investigators that Oyler told her he had started several wildfires in the Banning area earlier that day, it said. Investigators noted in their report that three arson wildfires were started on Oct. 22 in the same area. Oyler's girlfriend, Crystal Breazille, told investigators that Oyler told her about using a cigarette-and-matches device to start fires, although she never saw the devices, the report said. Breazille also said she knew Oyler had started an arson fire in Moreno Valley several months before and that Oyler collected newspaper clippings about fires, the report said. In a subsequent visit two days before the start of the deadly fire, Frame said, Oyler asked her for a ride so he could set the mountain on fire, according to another sheriff's report obtained by the Los Angeles Times. Date/Time of Occurrence: March 15, 2007 - 5:41 p.m.
Sacramento- A large fast moving fire destroys a railroad bridge in Sacramento. Over 100 Fire Fighters fought this fire, but were not able to stop the fire from destroying the entire bridge. The fire was reported at 5:41 p.m. and when Fire Fighters arrived, the bridge was totally involved in fire. Fire Fighters had to stretch their hose lines a long distance to access the nearest fire hydrant. The bridge is located in the American River Parkway area where there are no fire hydrants. Well over 100 Fire Fighters from the Sacramento area responded. Representatives from the California State Department of Fish & Game also responded to monitor the water runoff from the fire. At this time there is no evidence of any toxics getting into the American River. Officials from Union Pacific Railroad are also on scene, assisting the effort. Sacramento Fire Department Arson Investigators are on scene trying to determine the cause of this fire, which is considered "under investigation" at this time. One Fire Fighter suffered a minor head injury and was transported to a local hospital. At 11:23 p.m. Thursday, fire claimed the last remaining piece of a section of railroad in Sacramento that had burned for almost six hours. The trestle on the north side of the American River fully collapsed into a heap of burning timber and red-hot iron. The flames, visible for miles, raged across nearly 600 feet of a major Sacramento railroad trestle near Cal Expo during the peak of afternoon traffic Thursday. Sacramento fire officials said the blaze was expected to burn throughout the night north of the American River and could continue to smolder for the next few days. Sources also told News10 that investigators believe the fire may have been intentionally set. "We are doing our best to contain it. This is the type of fire that takes lots and lots of water. We'll be applying water on this for a while," Sacramento City Fire Captain Jim Doucette said. "I've never seen a train bridge fire this big.... I've seen pretty big fires in my career. This is in the top three. This was huge." The blaze started around 5:40 p.m. along the tracks near the Capital City Freeway, pumping huge plumes of thick black smoke high over the scene. The line is a major rail thoroughfare for Union Pacific and other railroad transportation heading east from downtown Sacramento. Sacramento Metro Fire spokesman Christian Pebbles said the fire spread rapidly, stretching across the length of a football field within minutes. Fire officials said they have not determined how the fire started, but the creosote-soaked trestle fueled intense black smoke that could be seen from more than 50 miles away. Coal tar creosote is a thick, oily liquid commonly used to preserve the peeled logs used to stabilize railroad trestles. The fire brought rush-hour traffic to a halt on the Capital City Freeway bordering the state fairgrounds as commuters stopped to look at the blaze. Some even got out of their cars and began walking towards the flames, forcing officials to use megaphones to warn spectators away. Portions of the structure began collapsing after 7 p.m. Doucette said nearly 100 area firefighters would continue to battle the fire throughout the night and hot spots could continue to burn over the next several days. According to sources close to the investigation, the speed of the fire's spread had authorities looking into the possibility that an accelerant was involved in the blaze. The heat and scope of the fire left even veteran firefighters in awe. "If this would've been a hot summer day, we would've had firefighters in the hospital right now," Doucette said. One firefighter suffered minor injuries battling the blaze, Doucette said. Union Pacific workers were also on scene, using heavy equipment to help tear down the remaining parts of the train trestle and tracks. The span will need to be completely rebuilt, a process that will take at least several weeks. As for Capitol Corridor passengers, service between Sacramento and Auburn will be provided by motorcoach buses starting Friday. Union Pacific on Friday assembled cranes, front-end loaders and other construction equipment to begin demolishing charred sections of a 300-foot elevated trestle, parts of which were still burning a day after it caught fire. The intense blaze, which began late Thursday, disrupted daily passenger and freight rail traffic that runs through the state capital. Union Pacific, which owns the railroad lines, said repair work could begin as early as this afternoon after fire officials complete a routine arson investigation. "We stand ready," Union Pacific spokesman James Barnes said. "Right now we're assessing how much of the structure is viable." Although Sacramento firefighters were able to stop the fire from spreading to a nearby bridge, the wooden trestle that crosses over a local bike trail and wetlands area just north of the American River, was expected to burn and smolder for a few more days. "The wood is thick, heavy timber. You can put all the water in the world on it and it's burrowing down into the wood," said Sacramento Fire Capt. Jim Doucette. Amtrak officials said it could be two weeks or more before repairs are completed. Until then, passengers on its roundtrip daily service between Auburn and Sacramento will be bused. The other daily train, from Emeryville to Chicago, will be rerouted and will run two hours late, Amtrak spokeswoman Tracy Connell said. "It's a pretty good service disruption," Connell said. "We're accommodating passengers as best we can and getting them to their destinations as close to on time as possible." About 130 passengers were stranded Thursday on a train in Roseville, a suburb northeast of the capital, for nearly five hours, said Amtrak spokesman Cliff Cole. Buses were brought in to bring the passengers to Sacramento. The cause of the fire remained under investigation. About 125 city and county firefighters responded to the blaze. One firefighter's head was hit after he attempted to move a heavy sign along the shore, Doucette said. The creosote-soaked trestle fueled an intense blaze that could be seen from more than 50 miles away. Before nightfall, the wall of smoke extended an estimated 2,000 feet into the air and bent in a giant S-curve, blanketing the capital skyline. Smoke was still billowing into the air early Friday. The burning creosote also raised contamination concerns for the nearby American River, which flows through Sacramento. Agents from the California Department of Fish and Game were testing the water draining from the trestle as a precaution, Doucette said. The spectacle drew a crowd of hundreds of pedestrians from nearby hotels and stores and crippled rush-hour traffic on the Capital City Freeway around Cal Expo, the state fairgrounds. The fire also burned near power lines and cut power to some local stores. In addition to halting Amtrak service, the fire also stalled freight traffic. About 50 trains a day use the Union Pacific lines, spokesman Mark Davis said. "All of them are being detoured on other Union Pacific routes," Davis said. For more information on the fire, visit the OCFA’s website at www.ocfa.org. (emergency information). for the fire is located at Irvine Regional Park, 1 Irvine Park Road, Orange. San Bernardino, Calif.— Conservationists in the inland empire and the Attorney General of California have urged San Bernardino County to address critical issues of global warming in its “General Plan” for the 21st century. The General Plan is the county’s blueprint for growth and development over the next 25 years. Despite questions raised about how the county will plan for the threats posed by global warming and fire, the Board of Supervisors is poised to approve a long-range plan without addressing how global warming and increased wildland fires threaten communities. Research released last month by the International Panel on Climate Change shows that global warming is “unequivocal.” There is a 90-percent certainty that human activities have contributed to a warming planet. According to Rich Fairbanks, forest and fire program associate with The Wilderness Society, “We now have some pretty solid science telling us that fires are getting tougher to suppress; it would be irresponsible not to prepare for this change in the fire environment.” Global warming is partly responsible for increasing large wildfires across the West, according to recent research from the Scripps Institute and the University of California. The length of the active wildfire season has increased by 78 days, and the average burn time has increased by 29 days. Increased wildfires will hit Californians in both their homes and their pocketbooks; the 2003 Old Fire, for example, destroyed over 1,100 homes at a cost of almost $50 million. San Bernardino County continues to experience high population growth in mountain and foothill communities adjacent to national forests. Global warming-related fire increases will cost the most in areas adjacent to forests that are close to major metropolitan areas, according to the California Climate Change Center. Federal agencies have challenged local governments to carry their weight in defending communities. Because of increasing costs of federal firefighting efforts and the failure of communities to regulate growth next to national forests, the Forest Service recommends assigning more financial responsibility to local governments. “Many conflicts, future problems and planning inconsistencies in the mountain region could be avoided by adjusting mountain zoning to the realities of the hazards of the forest environment, fire and public safety,” said Drew Feldmann of San Bernardino County Audubon Society. The recognized threat to the community posed by wildfire didn’t sway the county to protect communities in fire-prone areas from irresponsible development. The minimum 30-foot setback in the county’s building codes is fraught with exceptions because setbacks do not apply to a broad range of flammable structures including fences, decks, awnings, propane tanks, and garages. Research shows that distances of 65 to 130 feet are necessary to reduce the threat of wildland fire on residential structures. Mountain residents have expressed concerns about the adequacy of their roads for evacuation during fires with an over 50-percent population increase. Suggestions to use computer modeling programs that evaluate mountain evacuation scenarios were simply dismissed by the county. The Center for Biological Diversity is a nonprofit conservation organization with more than 35,000 members dedicated to the protection of imperiled species and habitat. www.biologicaldiversity.org . The Wilderness Society brings to bear scientific expertise, analysis and bold advocacy to save, protect and restore America's wilderness areas. www.wilderness.org . The San Bernardino Valley Audubon Society advocates for protection of wildlife and habitat throughout Riverside and San Bernardino Counties. www.sbvas.org . ...Los Angeles is experiencing its driest year on record...The last time it was remotely this dry was 1924, when 2.5 inches of rain had fallen...Right now, Los Angeles' rainfall is more than 9 inches below normal. It's unlikely that the region will record anything close to a normal rainfall total no matter what happens the rest of the season...Unless something dramatic happens, Los Angeles could very well break the record for driest winter, which occurred in 2001-02...The situation could get worse before it gets better if La Nina conditions continue to develop...The bottom line is we're in a drought, and six out of 10 years, L.A. is dry...When El Nino and La Nina are in doubt, go with the drought. To view the full article, visit the Los Angeles Times website." Windy Ridge fire - or - 241 Fire ? This earlier Orange County Fire Authority News release refers to the 241 Fire at Windy Ridge twice so what is the real incident name? 241 Fire or Windy Ridge Fire? The document is titled 241 Fire. The Orange County Fire Authority (OCFA) reports that the 241 Fire at Windy Ridge, which started on March 11 at 7:53 a.m. and has burned 2,036 acres, is now 80 percent contained with a full containment scheduled for March 13. The fire is being fought under a unified command between the OCFA, the Orange City Fire Department and the Anaheim Fire Department. A total of 115 engines and more than 800 firefighters have responded to fight the fire along with helicopters, air tankers and dozers. Two out buildings were destroyed in the fire and two homes inAnaheim Hills received moderate roof damage. Approximately 1,200 residents were evacuated on March 11, and most have returned to their homes with the exception of a section of the Serrano-Hidden Canyon area. The Anaheim Police Department has additional information on evacuation status. The cause of the fire has been listed as, “incendiary to a vehicle and the vehicle was stolen,” and the investigation is on-going. LOS ANGELES (March 12) - A fast-moving wildfire that blackened 2,000 acres and forced the evacuation of more than 1,200 southern California residents was arson, authorities said on Monday. 'This is an arson fire,' Capt. Steve Miller of the Orange County Fire Authority told a news conference. He said the blaze began when a stolen vehicle was set on fire, igniting nearby brush." Miller said the fire was 80 percent contained as of Monday, and should be fully contained by Tuesday morning. Two buildings were destroyed and two homes were damaged in the fire, which threatened an upscale Anaheim Hills neighborhood in Orange County, about 35 miles southeast of Los Angeles. Southern California was under an extremely high-risk fire warning over the weekend and Monday as hot winds drove temperatures up to around 90 (32 C) degrees inland after one of the driest winters on record. ANAHEIM, Calif. (AP) - Cool morning weather helped firefighters get ahead of a wind-driven wildfire Monday that was threatening hillside houses southeast of Los Angeles. The 3-square-mile blaze had damaged two homes but was 80 percent contained by midmorning, up from just 30 percent early in the day, fire officials reported. At daybreak Monday, the temperature was still in the upper 50s, compared to Sunday's highs near 100. 'The weather is cooperating at this point,' Orange County Fire Capt. Ian MacDonald said. Dry, windy weather remained a concern for the rest of the day, though, said Orange County Battalion Chief Ed Fleming. The National Weather Service forecast temperatures in the 80s and 90s. 'It is going to cause some challenges for the firefighters, but they are going to work through the day and through the night to make sure it is contained by tomorrow,' Fleming said. A red flag alert, indicating high fire danger, remained in effect in much of Southern California, where a prolonged drought has made the chaparral-covered hills highly combustible. 'In Southern California, we're always 24 hours away from having a wind-driven, low humidity fire,' MacDonald said. 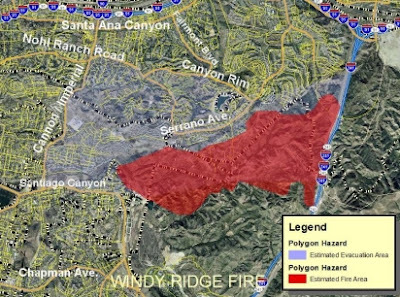 Windy Ridge Fire - Anaheim Hills Fire map of affected area. LOCATION: The fire began at the Windy Ridge toll plaza on the 241 toll road. Fire is moving toward Canyon Rim Road and Serrano Road in Anaheim Hills and Orange. A fast-moving brush fire scorched more than 2,000 acres of parched hillside and charred at least three homes, forcing authorities to evacuate more than 500 homes, fire officials said. The three-square-mile fire threatened many other houses and the firefighters were working to protect them, Anaheim city spokesman John J Nicoletti said. "This is a very dangerous firefight," said Orange County Fire Authority Chief Ed Fleming. "The terrain is quite rugged, with homes on top of ridges, and the fire picks up speed as it heads up the hill." Two firefighters suffered minor injuries, authorities said. The fire, stoked by hot dry winds and fueled by chaparral, spread south and west quickly in an unincorporated part of Orange County. It threatened multimillion-dollar homes here and in Anaheim Hills, about 56 kilometers southeast of Los Angeles. Authorities said the blaze may have been started by a vehicle fire, and were investigating if the car was stolen and set on fire to destroy evidence. Capt Steve Miller of the Orange County Fire Authority said afternoon winds blowing up to 56 kilometers made firefighting difficult for the more than 800 firefighters on the scene. Temperatures were above 32 Celsius and humidity was at five percent. But slowing winds later in the day allowed firefighters to get 10 per cent of the blaze contained Sunday evening, authorities said. Firefighters were aided by helicopters and planes dropping water and retardant on the flames, and police went door to door to warn residents to evacuate. The area, like much of Southern California, is under a red flag alert, indicating a high fire danger. A prolonged drought has left the chaparral-covered hills highly combustible. Fleeing fires has become a part of life for many residents. CONDITIONS ON ARRIVAL: Vegetation fire associated with a car fire Southbound 241 toll road. ACRES BURNED AT THE TIME OF THIS REPORT: 2,036 acres. STRUCTURES BURNED: At least four structures have received fire damage - two out-structures and two homes with moderate roof damage. ROAD CLOSURES: For road closure information, check with CalTRANS or the City of Orange. Up-to-date information about evacuations for residents of Orange and Anaheim. For more recent evacuation information, check with the Anaheim Police Department or the Orange Police Department. Animals should be taken to the Orange County Fair Grounds (for info, call 714-935-6848) and horses/livestock in Orange should be taken to El Modena High School. PRELIMINARY CAUSE OF FIRE: Incendiary to a vehicle around the Windy Ridge toll plaza and the vehicle was stolen. CURRENT CONDITION: Fire is traveling westbound driven by the winds. WEATHER CONDITIONS: A Red Flag Warning from the National Weather Service has been issued through Monday, March 12. Winds with gusts and low humidity during the day. Please "save" these stations on your battery-powered and car radios. The fire is 15 acres and is burning grass. The fire has the potential to burn 1000 plus acres. No structures are threatened at this time. No road closures. Thomas Brothers page 774, G4. UPDATE 1550 25 acres, 90 degrees, erratic fire behavior. UPDATE 1713 400 acres, threat to the Lake Matthews Preserve. UPDATE AT 1800 HOURS 500 ACRES, 20 PERCENT CONTAINED ESTIMATED 100 PERCENT Containment March 12th 1200 hours. Riverside County Fire Department - News Releases and Incident Information: "